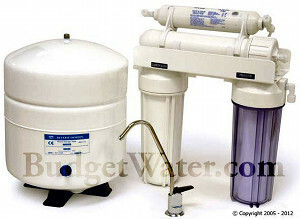 This Well Water Filtration System includes an Acid Neutralizer a 7" Terminox™ ISM Filter a 30,000 Grain Capacity On Demand Water Softener and a Reverse Osmosis System to provide you with clean soft water throughout the entire house. No matter what problem you have with your well water, we have a system for you. Be sure to check with a water quality technician by phone or e-mail to be certain you are ordering the correct treatment system. These units are recommended for people without a pressure tank or people who need to install the unit after the pressure tank. Acid Neutralizer, the backwashing acid neutralizer is the most maintenance free way to raise your pH and eliminate the problems associated with acidic water such as green staining and leaking pipes. You simply need only to add mineral on average once a year to this unit when it is properly sized. An acid neutralizer works by dissolving safe minerals into your water and neutralizing the acid that is found in many well water supplies. You can upgrade to a larger size or to our EZ fill tank for just a few dollars more.